Three adorable puppies rescued from avalanche in Italy 'gives us hope,' say rescuers. 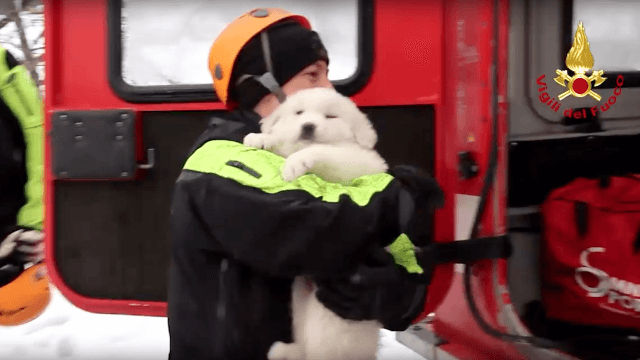 Tragedy struck last week when an avalanche hit the Hotel Rigopiano in Farindola, Italy, but on Monday rescuers found a little spark of hope in the form of puppies. According to The Guardian, rescuers found three fluffy little Abruzzo sheepdog puppies safe in the rubble of the hotel, meaning that there are still air pockets in the collapsed building. Firefighter Fabio Jerman said the discovery of the pups is "an important sign of life, which gives us hope." As of Monday, 23 people still remain missing in the aftermath of the avalanche, but thanks to these squirmy little fluff-babies, rescuers have new hope that the missing people could be found alive and well. This just confirms what I've known to be true for years: puppies make everyone feel better about everything, even if it's really terrible.